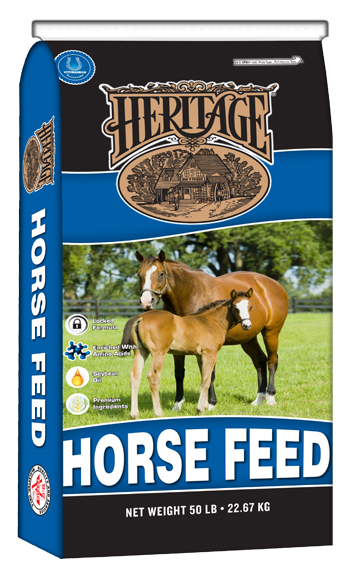 Heritage Foal Stater/Creep pellet is to be fed to foals from 7 days to 4 months of age. Vitamin A, Min ................................................ 9,000 IU/lb. Vitamin D, Min ................................................. 1400 IU/lb. Vitamin E, Min ................................................... 150 IU/lb. Biotin, Min ....................................................... 0.75 mg/lb. Steamed Rolled Oats, Dried Whey, Soybean Meal, Wheat Middlings, Soybean Protein Isolate, Dried Whey Protein Concentrate, Corn Distillers Dried Grains with Solubles, Milled Fax Seed, Calcium Carbonate, Soybean Oil, Saccharomyces vaisiae Yeast, Salt, Monocalcium/Dicalcium Phosphate, Dried Citric Acid Presscake, L-Lysine, L-Threonine, DL-Methionine, Ferrous Sulfate, Vitamin E Supplement, Choline Chloride, Zinc Hydroxychloride, Zinc Sulfate, Zinc Methionine Complex, Manganese Hydroxychloride, Manganese Sulfate, Manganese Methionine Complex, Basic Copper Chloride, Sodium Selenite, Copper Sulfate, Copper Lysine Complex, Niacin Supplement, Thiamine Mononitrate, Biotin, Vitamin A Supplement, D-Calcium Pantothenate, Folic Acid, Riboflavin Supplement, Pyridoxine Hydrochloride, Vitamin D3 Supplement, Vitamin B12 Supplement, Ethylenediamine Dihydroiodide, Cobalt Carbonate, Cobalt Glucoheptonate, Menadione Sodium Bisulfite Complex, Ascorbic Acid, Natural & artificial Flavor Ingredients. 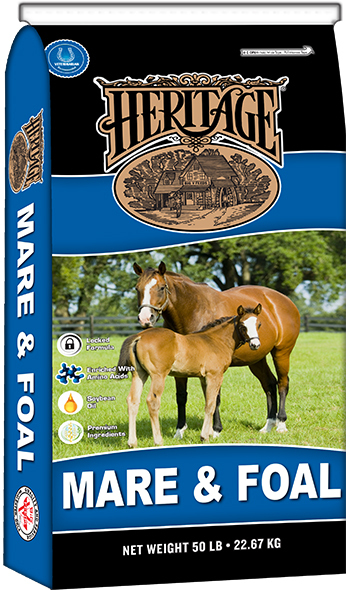 Provide free choice Heritage Foal Starter/Creep to nursing foals. Foals should consume 0.5% to 1.0% of body weight per day (1 pound of Heritage Foal Starter/Creep per 100 lbs. of body weight per day). Foals with expected mature weight of 1100-1300 lbs. 4 lbs. - 6 lbs. 6 lbs. - 8 lbs. 8 lbs. - 10 lbs. At approximately 4 months of age, the foal’s digestive system starts changing and the cecum micro flora will begin to develop or function. This will allow the young foal to digest forage and cereal grains. 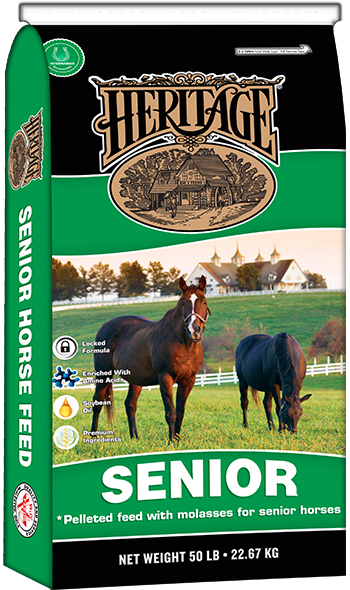 At 4 months of age select a high quality weanling ration that is formulated to be fed with forage. Mix 50/50 Heritage Foal Starter/Creep with weanling ration and feed for 1 week. After this, continue feeding with just weanling ration. This will allow for normal changes in the digestive system and reduce the chance of digestive upsets. 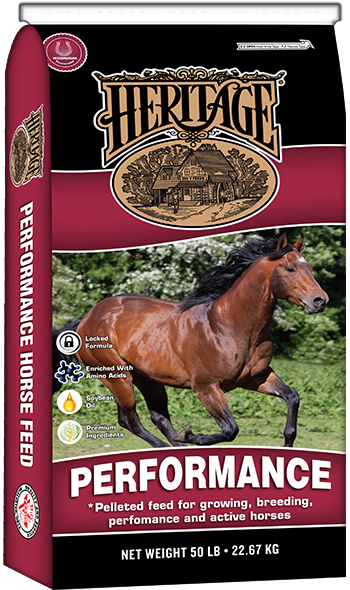 Heritage feeds are designed with the horse in mind and with only quality ingredients formulated using a fixed ingredient approach to insure a consistent nutritional product. 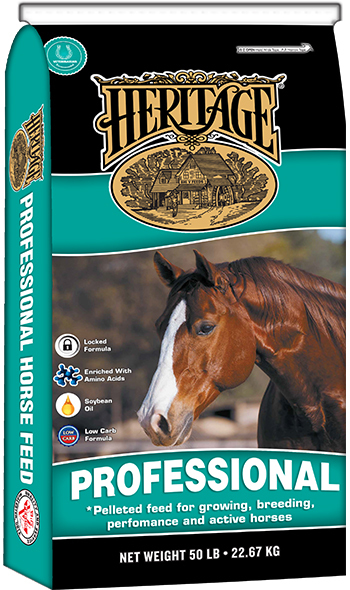 Whether your horse is a companion pet, broodmare, growing foal, or competes in equine events, Heritage has the feed to provide the balanced nutrition needed to excel and maintain proper growth. Contains milk protein and soy protein sources to help provide essential amino acids. Guaranteed amino acids lysine and methionine which serve as building blocks of quality protein needed for cellular building blocks of enzymes, hormones, tissues and skeletal framework necessary for growing foals. Remember, young growing horses are more sensitive to protein quality than mature horses because of the physiological differences. Minerals play a critical role in numerous metabolic functions. Proper mineral nutrition can help guard against developmental orthopedic problems in foals through direct consumption, or indirectly through mares milk. Yeast Extract and Saccharomyces cerevisiae (yeast culture) aid in providing a well-balanced and diverse intestinal mirobiome that help protect against intestinal disorders or generalized infections from intestinal origin. 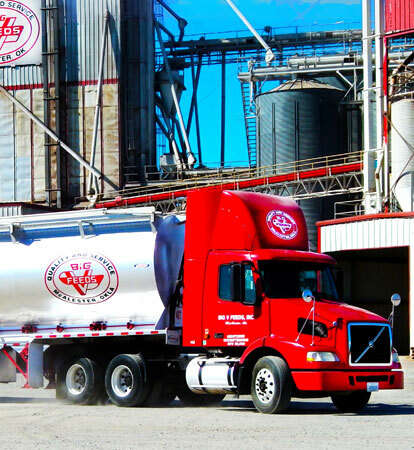 Research has reported that when fed certain strains of yeast, the activity of the immune systems increases. Highly palatable source of fat from soybean oil and flaxseed (sources of Omega-3) that helps provide extra calories for maintaining body condition, help promote healthy coat condition, maintain healthy membranes and provide antioxidants. A highly digestible transition feed from milk to solid feed that complements the foals changing digestive enzymes. A good feeding program is based on the weight, activity level, life stage and body condition of the horse that keeps it healthy and productive, and it is only as effective as the quality of management practices.